Download a template and learn how to set up your file for printing. 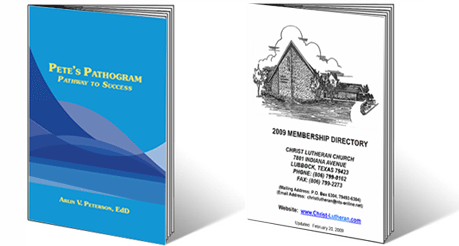 Booklets can be used as sales catalogs, membership rosters, media guides, pamphlets, newsletters, and programs. We can design, print, fold, staple, and mail your booklets. We offer standard sizes and can create custom size to meet your needs. We take care of it all – we’ll do all the folding and stapling so your booklets are completely ready when you pick them up. Need to split your order and ship to multiple locations? Let us know and we’ll take care of it for you.